As you may know, it is Mardi Gras time in New Orleans. You may also know that we just returned from a trip to New Orleans this past weekend and would really like to go back for another adventure. One can never have too much fun! I will be writing a series of articles on New Orleans over the next couple of weeks. Of course, I had to include a recipe for King Cake in the middle of this series since King Cake is a Mardi Gras tradition. If you are joining in on the festivities, you you will want to have one of these cakes on hand for Fat Tuesday next week. You can certainly buy one, but what’s the fun in doing that? This was my first time baking a King Cake and if I say so myself, I think it looks pretty good! How could homemade, sweet yeast bread filled with brown sugar, butter, pecans and cinnamon which is then rolled into a coffeecake, baked and topped with icing be bad? It can’t! This was scrumptious! 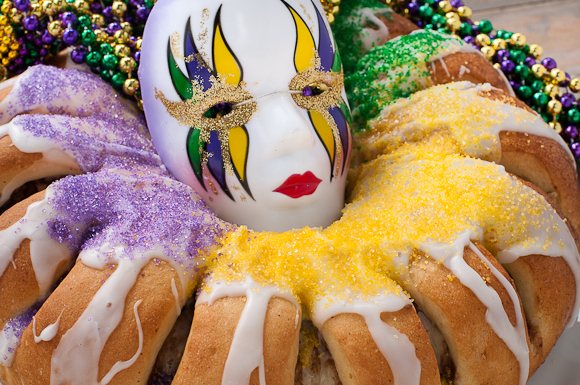 You can find the complete history of the tradition of the King Cake at the Mardi Gras Digest. 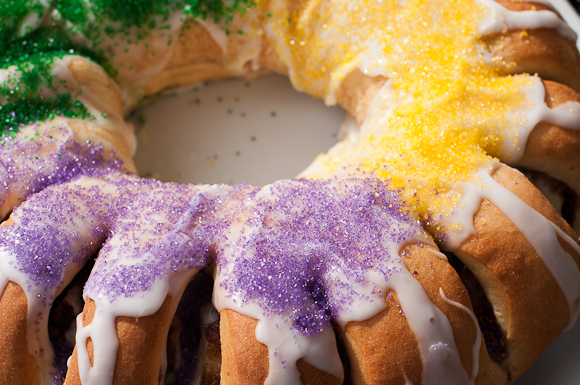 According to Wikipedia, “The “king cake” takes its name from the biblical three kings. Catholic tradition states that their journey to Bethlehem took twelve days (the Twelve Days of Christmas), and that they arrived to honor the Christ Child on Epiphany. The season for king cake extends from the end of the Twelve Days of Christmas (Twelfth Night and Epiphany Day), through to Mardi Gras day. Some organizations or groups of friends may have “king cake parties” every week through the Carnival season. I love my Mardi Gras beads with the mask! The “trinket” that is most suggested to put into the cake is a small, plastic baby. Of course, the day I was looking for one of these babies, there were none to be found, so I used a whole pecan (which is also a suggestion in some recipes). You just might want to warn someone that they could brake a tooth on one of these little surprises in their King Cake. Would you like a slice or two? Combine the brown sugar, ground cinnamon, chopped pecans, 1/2 cup flour and 1/2 cup raisins. Pour 1/2 cup melted butter over the cinnamon mixture and mix until crumbly. Note: My cakes took about 25 minutes to bake. I covered them with aluminum foil at about 15 minutes to avoid excessive browning. Note: When you are ready to ice the cakes, you might want to make the icing seperate for each cake, especially if you are going to sprinkle them with colored sugars. The icing hardens pretty quickly. This looks and sounds FAR better than any king cake I’ve ever eaten. I wish I had more time this week..I would make one of these! I’m bookmarking it for next year though. Thanks for sharing, sweet woman. I hope you have a great Wednesday. Happy Hump Day! Thanks so much! This was a very good recipe and worked quite well, so you should definitely try it next year. Happy hump day to you as well! It’s been quite the week (for you, too). That looks so delicious. Why don’t you bring me a slice? I don’t mind helping you eat that second cake as long as I don’t have to flash you for it. 🙂 Happy Mardi Gras! I would bring you a slice, but it is all gone! I wish I could be there for all the Mardi Gras festivities! We would all have quite the time. Thank you. No baby. I couldn’t find anything small enough. I used a whole pecan instead. The trip was so much fun I am ready to go back! That may be the best looking king cake I’ve ever seen. It’s amazing. Even the inside looks more moist and tender than most (which are just lumps of dry yeast bread). Wow. Thank you. I read reviews of a few recipes that said they were dry, but this one had positive feedback. I must say that I agree. It was very moist. A must do again, for sure! Thank you, Becky. I can’t wait to see your version! I am sure it turned out great. 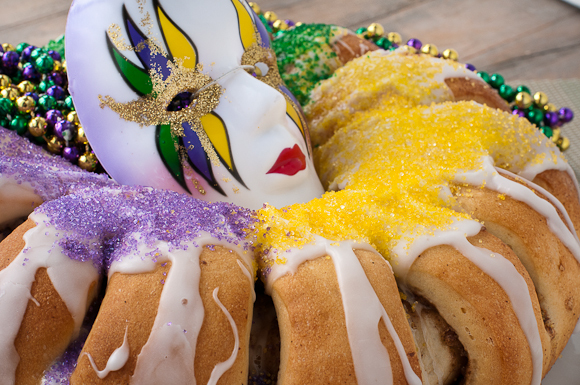 Great info about King Cake! Most do not look appealing to me, but yours looks absolutely great! Well done! It is an interesting story behind the King Cake. 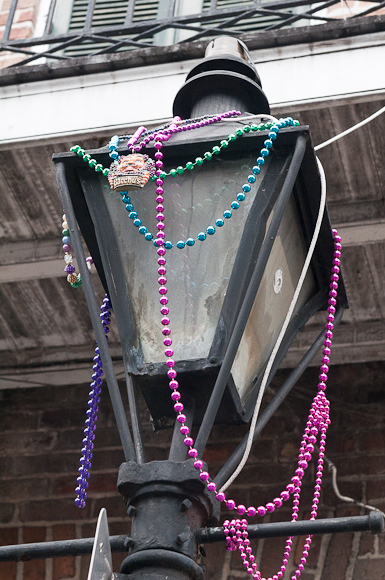 There are so many great traditions in New Orleans and Mardi Gras is certainly one of them! Thanks! If I had some leftover I would share it with you, but we ate it all! 😉 I am sure you will do a great job making the King Cake! Most gorgeous Mardi Gras cake I’ve seen. Fabulous job! This looks delicious! Heading to NoLa myself this weekend and really looking forward to reading your recap! fun, jolly and sophisticated decorations, almost too gorgeous to eat! Looks delicious too! I’ll say you did a pretty good job with this cake–it’s gorgeous! Much better than the bakery versions. What fun! Can’t wait to hear more about your trip. I’m definitely tackling a King Cake this year. I meant to do it last year and ran out of time. This looks like a perfect recipe to try out! Pretty darn good you say? Gwen OMG that cake marvelous!!! I’ve not experienced a King Cake yet. Shame on me. you would never know this is the first time you made a King Cake – i’d say you’ve got this down Gwen!!! loved reading this history of this cake and since i’ve not been to NOLA, this cake will have to do – spectacular!!! Absolutely stunning, colorful and festive post! 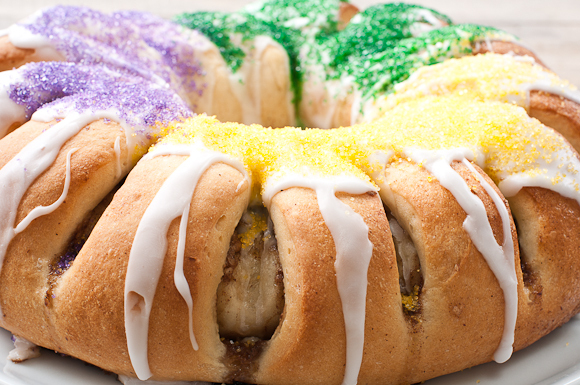 The filling in your King Cake sounds so incredible. I’m kicking myself for not buying a mask and beads while we were there! This is certainly a beautiful cake! I like the colorful sugar sprinkles that you decorated it with. I also like that you used a pecan versus a plastic baby, it seems more natural. I’m looking forward to seeing more pictures from NOLA. what a perfect way to start the season, and what great images!!! I love your new design, its very clean , it has a good feel to it! Discovered your wonderful King Cake via Top 9 today. Congratulations! It looks so different to the King Cake in France which is served for Epiphany. Yours is just beautiful and love the tradition of party hosting! Your photos are so amazing, beautiful and helpful. The way you wrote out the recipe and added the photos make this even more enticing. I must try this! I’m from southern Louisiana, and I eat king cake every year. I don’t recall ever seeing one that makes as lovely a presentation as yours. I was just going to buy one, but now I’m eager to try your recipe! Happy Mardi Gras! I love hearing the history behind food traditions and I like your party idea even more 🙂 This is the best looking King’s Cake I’ve ever seen! Congrats on the Top 9, Gwen. Have a fantastic weekend! Nicely done! Congrats on the Top 9, your cake is beautiful! YAY!! I’m making a king’s cake this weekend too, from that very same recipe! Except instead of sprinkling different colored sprinkles, I may make different colored icing! Fabulous!! Looks good! I especially like the idea of scoring the dough like you did! I just posted my updated King Cake recipe that I have been perfecting for over 30 years. Pretty good isn’t enough to describe how great this cake looks! It’s really a work of art. I love the final icing touches… just beautiful! Gorgeous! Love this presentation… congrats on Top9 spectacular cake! i am planning to make my first king cake this weekend for a variety of reasons, but i was not particularly looking forward to it until I saw yours! Your filling looks tremendous-I think I will steal it and use it instead of the cream cheese one that my recipe suggests! This looks awesome, my friend and I are making this for her French class for Tuesday!! Wow just wowww..I am totally impressed! This looks amazing. 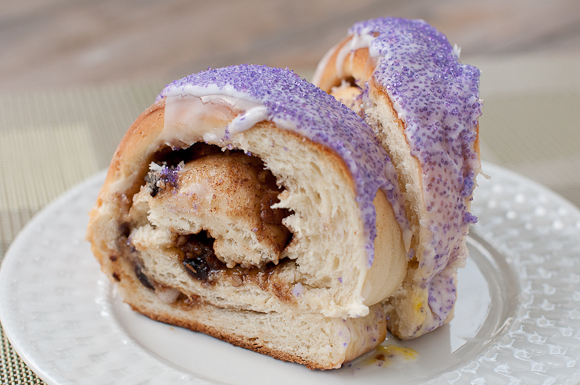 I had store bought king cake and enjoyed it, but this makes me yearn to make one of my own! This looks fantastic. I’m making it literally right now – the dough is rising – and am pleasantly surprised that it makes two rings. Perfect! I’m not sure how I missed that fact, but it makes this all the better. I’ve never been to Mardi Gras. Can you believe it? Love your posts on everything New Orleans! Congratulations on making the top 9! 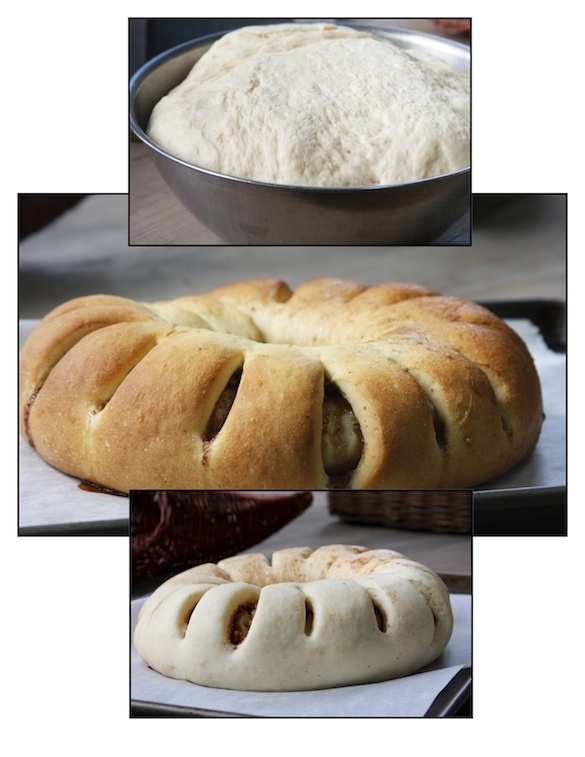 For a first try this is one fabulous, perfect King’s Cake and a recipe I will definitely be trying. Perfect texture and love the filling. I am so happy to hear that you had great success with the recipe and that it was thoroughly enjoyed! We thought it was excellent, too. This cake is gorgeous! I tried making it today with whole wheat flour and it came out really tiny! I make a king cake every year and thought I’d try something different…and I think it failed. Is this because of the wheat flour, you think? P.S. I think it’ll still TASTE good. It’s just more like a…Prince Cake! The rule is not to substitute more than 1/4 of the total amount of the flour in a recipe with whole wheat flour. That may be why your recipe did not work. Baking is definitely a science, so when you alter a recipe, it may not work as you expected it to. I am sure the flavor may still be good, but it will be denser and not as light as the original recipe. I hope you will try this again with the original recipe. It is a fabulous cake. I hope so! This was a really great recipe. Would you be willing to send me high res images of your cake, mask and beads. 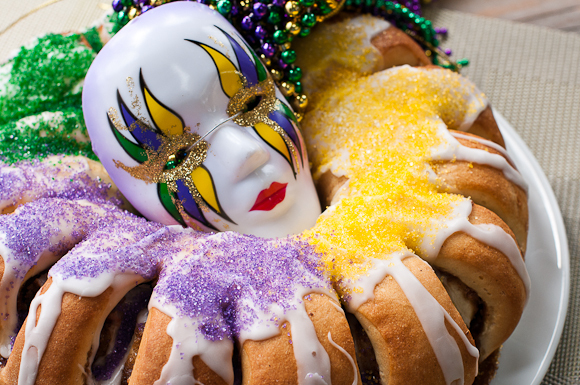 Images of the headline picture and other king cake pictures that have the mask and the beads? 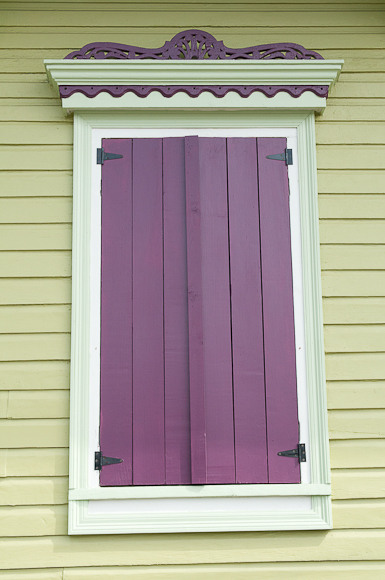 I would like to use your pictures in our newsletter for fat tuesday. I made this and they came out awesome. The only thing was the icing harden faster than I thought it would. But you did say it would. So I didn’t get as much sugar as yours did. The second of the two was better with the icing and sugar. But I still wasn’t fast enough. I will be making more towards the end of the month when Fat Tuesday gets closer. Thank you for sharing this. .